There are six directors* that form the Board of Directors (BOD) for RUPA. This group works together over the summer to prepare for the academic year and promote RUPA during summer orientation for incoming and transfer students. During the academic year this board maintains the policies for the organization, manages the budget, approves all event proposals, and sets the goals of the council. We meet every Monday night. Each Director is responsible for one of the six committees within RUPA. Approximately 20 Assistant Directors* are selected each year to serve on one of the six committees under the direction of their Director. These Assistant Directors work on a committee team to manage the daily business of RUPA, plan and manage specific categories of programs, and market all events. One Assistant Director per each committee is designated as the Marketing representative for that respective committee. 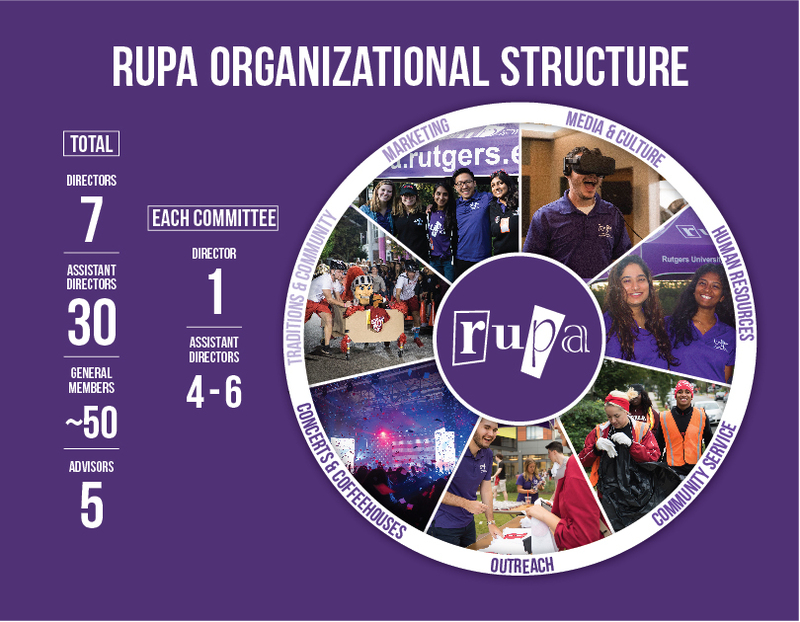 RUPA plans approximately 150 events during the school year and is seeking about 25 students to provide event staffing, customer service, and logistical support.These students have the opportunity to work on events for all the committees. For more information about each committee, please see the Committee Descriptions on the next page. This is a great first step to join one of the largest student run organizations on campus! All undergraduate students have the opportunity to attend our bi-weekly interest meetings to learn more about our organization, provide event ideas/feedback, and assist with programs throughout the year. RUPA is advised by five staff members and one graduate student from the Department of Major Events and Programs. Any undergraduate student with a minimum 2.5 cumulative GPA may apply. Each applicant (Special Ops Squad, Assistant Director and Director) should attend one of two Interest Meetings taking place before applications are due. 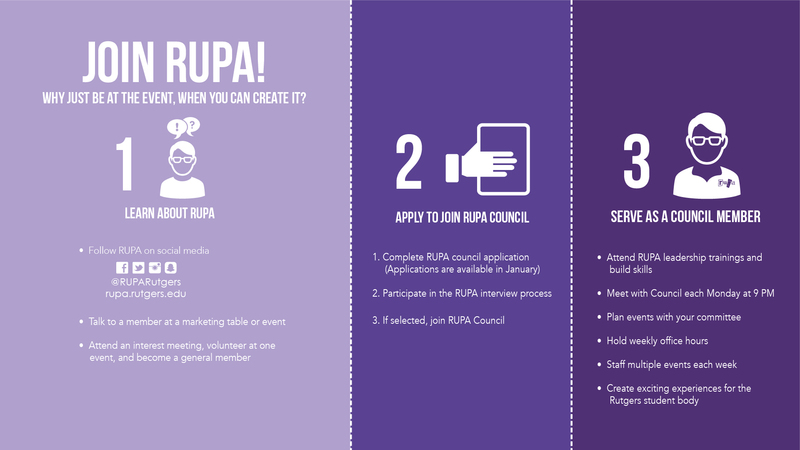 You don’t have to apply to be on council to be a part of RUPA. All undergraduate students can get involved by becoming a General Member at any point throughout the academic year by attending our bi-weekly General Interest meetings and volunteering at various RUPA events. Students are not required to become General Members prior to applying. To learn more about how to join, attend one of our upcoming General Interest Meetings or email rupa.humanresources@gmail.com. To learn more about General Interest Meetings, please visit the event Facebook page.